I started composting before I had much of a real garden! I just had some random pots and few sunny places to plant a few tomatoes. I’d save all our veggies, fruits and whole grains’ waste. We bought a composter at our local farmer’s market – the city was offering a special deal. I’d put the food in and every so often sprinkle in some dirt or soil. Then we had plans to expand our garden. I wanted my own garden ever since I was a teenager. We took down a few trees and finally had a long narrow strip of dirt with adequate and much needed sunlight -about 26 feet long by almost 4 feet deep. We had to move the composter during this time. The bottom of the composter was open, so as we moved it the composter materials spilled out and were mixed in with the old soil. This happened during wintertime! Then, when February came around, I noticed sprouts springing up. I’d figured they were weeds or possibly the trees coming back, but decided to wait and see. Soon I began to realize it was acorn squash, zucchini squash, yellow squash and lot of tomato plants. About 6 feet of my garden came up from the composter! It was such a pleasant surprise and the plants were strong since they grew from seeds and did not need to be transplanted. Plus kids think this is super cool -when I tell my daughter’s friends the story of how our meal scraps turned into a garden! Gardening has been such a joy! It’s hard work ,which is good for the soul regardless of how many foods are harvested. There are so many benefits to composting and anyone can do it. Compost makes your soil richer! Compost helps cleanup contaminated soil by absorbing and treating semi volatile and volatile organic compounds. Compost is good for the environment and helps prevent pollution –decreasing CO2 emission. Compost offers economic benefits by reducing the need for water, fertilizers, and pesticides –plus it helps create soil, saving you money at the garden supply store. 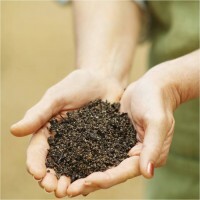 Compost creates a useful product from organic waste that would otherwise have been landfill. I also like composting because I don’t have to use the garbage disposer –I’m concerned about the environmental impact of garbage disposers. So instead of putting the plate waste into the garbage disposal I compost any plant based leftover’s. I even add in outdated herbs and spices. I keep big yogurt tubs by the sink, and scrape the plates there. Then transfer the scraps to the composter every few days.